I first came across the term “displacement activity” in Desmond Morris’s bestselling book of popular sociology from the 1970s, Manwatching (along with some rather racy photographs that helped me through adolescence – well, the internet hadn’t been invented yet, we had to make our own entertainment). A displacement activity is anything you do that brings comfort while at the same time puts off some other activity you don’t want to face up to. I’m going to follow one of the Humber “keel and sloop” gansey patterns from Michael Pearson’s book (the old edition, not the new reprinted one, since when I went to order it from Amazon UK I found it had already sold out, after just 3 days, dammit – so congratulations to Michael on a successful launch). I plan to adapt Mrs Jackson’s pattern from p.102, one of the really elaborate ones. It’s one of those ganseys with a plain body and a patterned yoke. 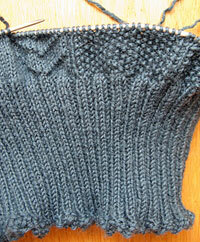 I’ll post the yoke pattern when I come to it (in other words, when I’ve worked out what it’ll be!) but one of the elements of this pattern that’s a little unusual, and which I wanted to explore, is a narrow patterned panel either side of each seam stitch (see pattern chart). This consists of a section of moss stitch bordered by a 15-stitch chevron panel – the rest of the body is plain. These strips run the whole length of the body, and continue uninterrupted into the yoke, and on up to the shoulder. It’s too early to tell how they’ll look – I’m barely an inch into the body – but already it helps break up some of the endless knit stitches you get with a completely plain body. We occasionally get asked what Margaret gets up to when she isn’t riding shotgun on my various gansey projects. Being rather more representative of the wider knitting community than I, the answer is, pretty much whatever takes her fancy. Here’s her latest project – I think it’s a modified fishing net for catching moths, but I could be wrong. After much to-ing and fro-ing, I finally depart for Wick on Thursday 13th, when hopefully I will move into my temporary lodgings (Margaret’s coming up for a few days, but will be returning to Edinburgh until we find somewhere more permanent). So there may be some disruption to the blog over the next few weeks – please bear with us, if so. And I start work on Monday 17th, which gives me a week to try to remember just what it is that archivists do. Compliments to Margaret! That is a beautiful lace project. I also love the way the Conifer is showing off the pattern. Best of luck with your move and the orientation of the new job, location, weather, etc. Oh, dear! Like St. Paul on the road to Damascus, the scales have been lifted… my entire body of work in the craft realm for the past 20 years was displacement activity. The greater the avoidance, the more inspired the output. Do I regret it? Let me go start another project while I think about that. Congratulations to Margaret on the lovely lace shawl. As for Humber: displacement activity or no, it is going to be very handsome. Good luck with the move! We’re all rooting for you. Good luck with the move. 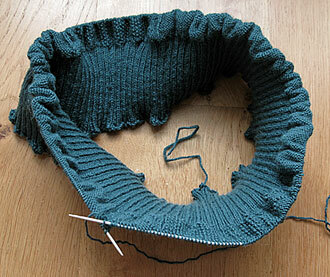 I remain very awed by the speed at which you knit and Margaret’s lace is stunning. I have only knitted a couple of inches of mine. Ex au pair (single mum) staying for two weeks with 5 week old baby, large dinner party for 10 on Friday, various sons unexpectedly home and First Aid courses are really no excuse. I will be more focused this week. Michael Pearson’s reprint is available from Waterstones online, free delivery if you can’t wait for Amazon to re stock. I shall go and have a look at p102. All my gansey books, curently stacked up by my bedside, provide the perfect displacement activity to sleeping! Thank you for your good wishes! It’s much appreciated. And yes, Margaret makes astonishing stuff, but she’s not as verbose as I, so she doesn’t brag about it – just rolls up her sleeve and gets on with it. Lynne, I’ve always been a fan of conifer. The problem is, when you offer to make ganseys for other people, they usually want navy, because that’s the colour they associate with ganseys. (I can sometimes persuade them to accept cream, like a cat.) In this case I’m afraid I just didn’t offer my victim a choice! Deborah, how nice to hear from you. Alas, employment beckons, so I’m afraid the rate of progress will drop alarmingly from now on – in fact, I suspect work will be such a shock to the system that I’ll be fast asleep by six! But my motto is, a gansey is for life, and often that’s just the knitting! Thanks for the heads-up on the Pearson – I hadn’t thought of Waterstones, but will give them a go. hello Gordon,wish you also good luck with the move. Hi Annalies, and thank you. Things are so intent right now that, though I’m not much of a drinker, but I’m beginning to see the point! THAT is a wonderful Aeolian – do tell Margaret. I’ve cast on for one, but then got distracted by something which was more urgent, but clearly not as important, as I MUST have one. I’ve made two full-size Laminariae and one mini Laminaria; I desperately want to make a Torreyana as well. Currently, I’m working on a Vermont Shawl in a beautiful autumn-leaves multicolored Madeleine Tosh Lace; I thought it appropriate for my trip to New England. I might bead the rest of it, just to add fun and sparkle. I’m in a hurry – late for class – but I wanted to compliment her on the lace. It’s fabulous. I have a happy image in my mind of someone with a fish skeleton pattern being pursued down the street by a load of hungry ally cats! Well, you’re the one who linked to the fish skeleton pattern, so it’ll be all your fault when the alley cats knock me down and eat my sweater! 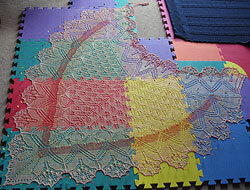 The lace shawls do look a bit like lepidopterae; I wonder if there are any named that! I should look that up in Ravelry… hang on a tick? Ravelry shows four things named Lepidoptera. None is a light airy shawl. Clearly there’s a need! I’ll get designing right away. Gordon I will be thinking of you on the 17th. 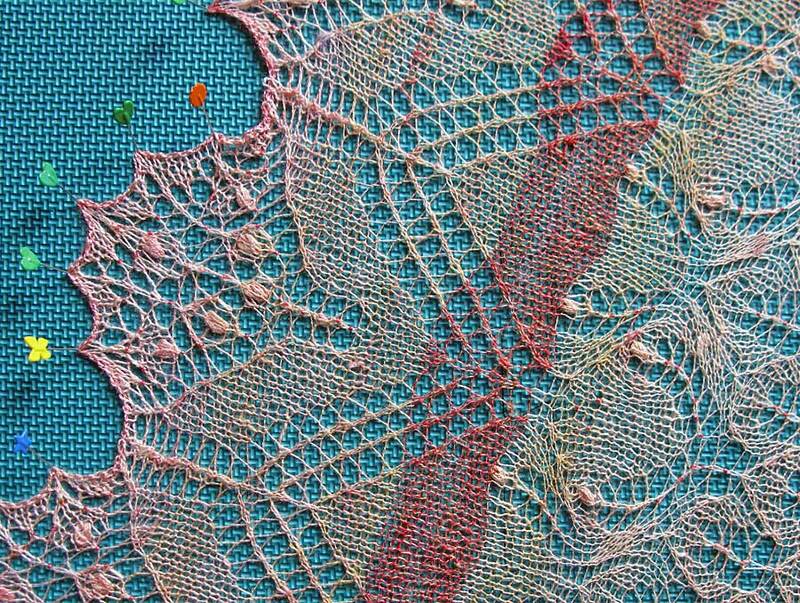 Kudos Margaret on an absolutely stunning lace project. How long did it take you to do that? P.S. In Berroco’s Get-the-behind-me-Satan Email, there was a link to an animated film short about the consequences of being too focused on knitting sans everything else. It is on YouTube and is called “The Last Knit.” I thought it was hysterically funny and kept nodding my head thinking, Yep, that’s me alright. I did not copy the link here because of fear of spam. P.S. Re: Michael Pearson’s book, Amazon US is showing release date 03/15/2012. Your new gansey looks pretty good! If I think about casting on so many stitches I consider you are very patient. The lace shawl of your dear Margaret looks wonderful! Congratulations. I sort of enter a zen-like trance when I cast on, and play some music I love, and gradually it just gets done. It always takes longer than i expect, so I think I’ve been doing it for hours when I’m only a third through. So I despair, and consider running away to join the merchant navy, and then all of a sudden it’s done. Margaret is the talented one in the partnership, I’m the shameless self-publicist! This blog is fast becoming my displacement activity. I like to think we’re fulfilling a sort of public service by taking people’s minds off more important things!